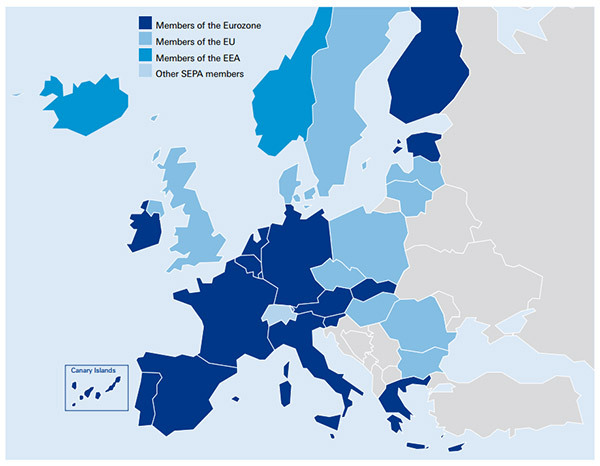 The Single Euro Payments Area (SEPA) stands for an EU payments integration initiative and consists of 28 EU Member States plus 3 EEA Countries and also includes Iceland, Norway, Liechtenstein, Switzerland, Monaco and San Marino via EU agreements. Both the SEPA ‘Core’ and ‘B2B’ Direct Debit Schemes are already mandatory in Euro domicile countries replacing existing legacy Direct Debit Schemes. SEPA holds vast opportunities and benefits for Creditors working with European customers and collecting payments in euros representing a single market of over 11,000B€, with 4,000+ participating banks and 210M+ households. A SEPA Direct Debit (SDD) is where a Creditor (the party collecting) has the authority to collect ‘euro’ funds from a Debtor (the party paying) from their bank account using the SEPA Direct Debit Scheme. SDDs can be used for single (one-off) or recurring collections and is a safe and efficient payments scheme for collections in euro. About the European Payments Council (EPC)? The European Payments Council (EPC) are the decision making and co-ordination body of the European banking industry in relation to payments. Created by the industry, and at the request of European Union (EU) authorities, the EPC commits to developing and updating the SEPA Scheme rulebooks. Helping to realise the vision of harmonised electronic euro payments and a truly ‘Single Euro Payments Area’. All ‘euro-denominated’ payments can only be collected using SEPA. Questions about SEPA Direct Debits?